I had three visitors this week! Sal arrived on May 10th and Jim and Kathy came in on May 13th. Sal left yesterday morning (May 17th) and Jim and Kathy will head out on May 20th. Kathy is back at Agua Dulce! Agua Dulce (“Sweet Water”) is the name of the Wood family property that we live at while working in this region. Sal and Jim have teamed up with me and Simon in the field while Kathy has been working at Asilo and the preschool that Melissa (a super cool speech therapist from the States) started in partnership for the adjacent Ngobe village. Before Jim and Kathy arrived, Sal, Simon and I worked in Buena Esperanza, Shark Hole and Valle Escondido. 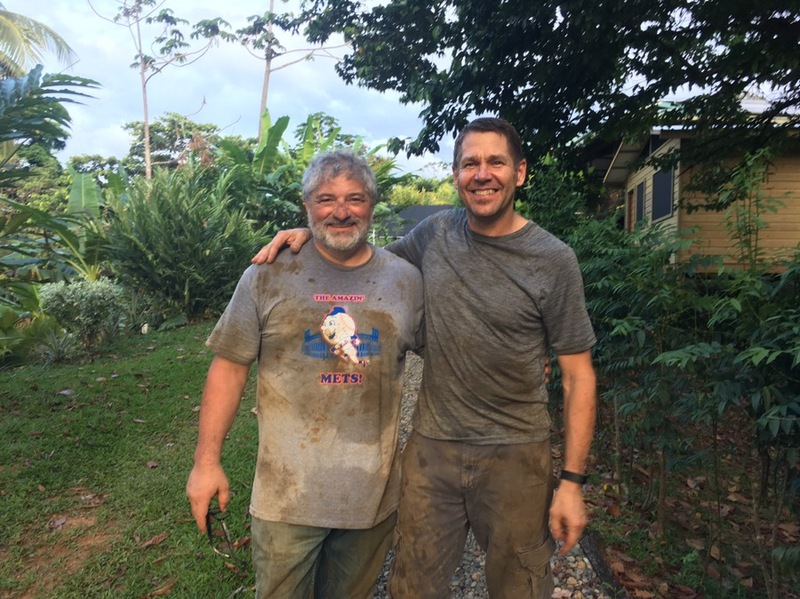 We installed a pump in the well mentioned in my last post – where Hortencio and his wife worked together to drill in Buena Esperanza. We also brought more medicine for little Elmer – the 3-year old child with the infected sores on his body. Please keep Elmer in prayer. The medicine is a temporary fix for the moment, but he needs prayer for overall healing of his little body. We also installed a pump in the well for the birthing mothers and babies home in Shark Hole. This was Simon’s first well in Shark Hole which he drilled to support the birthing house. We started to install this pump about a week prior, but had the wrong schedule pipe. It was much nicer to install the pump without a downpour this time! ​With the addition of Jim, we couldn’t fit in the cayuco so we borrowed one of Bobby’s larger boats. Look at how much room we have in this boat! (side note about Simon’s boat: A friend commented on my last post about what we were doing to raise money for Simon to have a fiberglass boat. We don’t have an official fundraiser set up, but if anyone would like to donate specifically to Simon’s boat, you can hit the “donate” tab at the top of this website and it will bring you to Hydromissions donation page. There is a pull-down menu to direct the funds to my name. The funds will be sent to me here in Panama and I will direct them to the boat. A rough estimate at this point is $1700, of which we have received $400 so far). With Jim and Sal now on our little team, we tackled some harder tasks that Simon and I couldn’t handle alone. We all worked in Valle Escondido. This was the community that I said should change their name to lots of hills! The community of Valle Escondido had a little spring that they were piping down into the homes in the mangroves. I had worked with Andy (healing fund team) to replace a broken water tank directly below the spring, but the spring itself needed some improvements. I really don’t like working with springs because they are hard to protect against contamination, but since they already had the spring and were using the water, I wanted to make improvements to their system. The two pictures sort of show a before and after. As you can see, its a muddy mess, so you can imagine we didn’t take our phones out much for photos. “Before” Photo: I have the shovel in my hand in this photo, but Jim really did the majority of the digging and Sal worked hard to pull part of the metal material used to dam the water originally. “After” Photo: Again, I look like I am working hard here, but I was just moving rocks and stabilizing our new wall. We used fiberglass as our little water dam. It took us two days to finish the little spring improvements, but we also worked on rain catchment on those two days as well. We installed gutters/tanks on 5 houses total in those two days. I can’t really express how different it is to work here, so just see the photos of one of our gutter installs. The teenage son of the homeowner was on the roof, pulling this “gutter” on, while Sal and I stabilized it. Above is a photo of Nelson and his wife receiving a solar flashlight and a bible. We have worked with Nelson on five different days by this point and we had lunch at their house earlier this week (the first Ngobe family to invite us in for lunch). Simon had been sharing with Nelson that we did this work to glorify God and share His love with those we helped. I appreciate that Simon takes his time and builds a little relationship before handing out the bibles. I think the recipients value them more that way. The last house we worked at was the furthest away from the main section of the community. It is the home of a single mom, Elia. I had two different projects planned for Elia (rain catchment and drilling a well), but we were only able to accomplish the rain catchment on Tuesday. Today, Jim and I are returning with Simon to drill the well. It is difficult to work at Elia’s house because she lives so far away (about 25 minutes of HARD walking up/down slippery slopes) with just her children and elderly parents. Usually, with well drilling, we insist one having at least 3 volunteers, although 6 is ideal for well drilling. We bend our rules for certain scenarios and this is one of them. Elia can’t get volunteers because she lives so far from everyone else so we are just working on our own to help her and not making her search out volunteers. Hopefully the little middle school-aged boys that helped us carry equipment to Elia’s on Tuesday will help us again tomorrow! The tank looks like it has a worried face, doesn’t it? I bet it is thinking that I am thinking of rolling it down the hill. Which I was absolutely thinking while carrying it down the hill. I am sorry if this particular blog felt a little hectic – this week of projects in three different communities has been a bit hectic! I hope that you all enjoyed the little videos – I had a meeting in Bocas town yesterday so I used a restaurant’s wifi to upload the videos. Awesome pictures and narrative, Cait! That mangrove mud does stink, but just think of it as the beginning of the aquatic food chain. Re: Cait-in-the-boat … where’s the fishing gear? And Cait, a round barrel does not need to be carried DOWNHILL … I hear that it will roll down on it’s own quite nicely! Be Safe !!! Cait, thanks for sharing these incredible adventures with us. All of you work so hard and accomplish so much, in such a wild terrain. Bless all of you and thankful the kids are able to help so much. You’re a good teacher!!! Stay safe and say hello! You are a true blessing Miss Caitlyn and loved ever so much by so many. Have another great day!!! xo linda and all the gang from the healing fund!!! Pingback: Back to those slippery HILLS! | How Many Cows?